Amid huge fanfare and a cine extravaganza, the first look poster of Rajinikanthand Akshay Kumar from Shankar’s 2.0 is set to be launched in Mumbai today, Sunday in Mumbai. 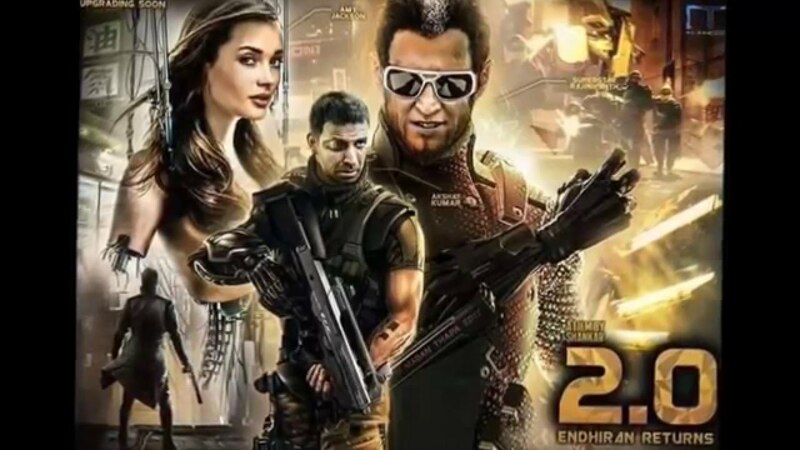 The sequel to Enthiran (Robo in Telugu and Robot in Hindi) is touted to be the costliest project in Indian cinema clinching the rank from Baahubali. The film is said to be made at a whopping budget of Rs. 350 crore. The first look launch is one of its kind as the looks of Rajinikanth and Akshay Kumar will be launched in 3D by Lyca Productions. The event hosted by Karan Johar would also see popular stars Kamal Hassan and Shah Rukh Khan sharing the stage with Rajini and Akshay. Huge LCD screens have been put in place to set the tone of the mega launch. Meanwhile, fans of Rajini have lined up outside Yashraj Films to welcome him for the event. The superstar arrived at YRF in a white Porsche and staying true to himself, he stepped out wearing a simple white Kurta. Soon enough Akshay arrived followed by leading lady Amy Jackson in their respective cars. Salman Khan has come for the launch, he said he was not invited but he came because he knew Rajini is here for the launch. “I just wanted to see Rajinikanth. Most amazing man. I have a lot of respect for him. I wasn’t invited. I got to know the was launch here. So came here. Akshay Kumar is the only actor who has had growth in our industry. Rest of us are stagnant,” said Salman Khan. Amy Jackson who is working with Rajinikanth for the first time was euphoric for being a part of this project. “I had no idea that I would be a part of this film with these legends. I was intimidated initially but on sets, everyone was like my family,” she said. Akshay Kumar had hours before shared his avatar from 2.0 on Twitter. Well, he looks no less than Nolan’s Joker or Bane. No wonder the make-up for his role took him 6 hours every day to get into the character! However, A R Rahman feels that composing music for this film is a tough nut to crack. “It’s the toughest film I am doing. He is not happy with anything I am doing. I am trying to create something unique for India and the world,” the music director said. Even Thalaivaa himself expressed similar sentiments saying how tough it is a job to work with the director. “To work with Shankar is difficult. He is a perfectionist. That is why he is one of the biggest directors. This picture as 3D is a different experience. But the truth is Akshay Kumar is the hero,” said Rajinikanth. Director Shankar, who gave great visual heavy films like Robo and Vikram strarrer I, feels that this film has been a tremendous task for him. “The film 2.0 was like having Everest on my shoulder and climbing another Everest,” said the director. V Srinivas Mohan who is the VFX designer for 2.0 said that this film has effects much grander than his earlier works — Robot and Baahubali. Director Shankar says that audience need films like Baahubali and 2.0 more. Lyricist Mahdan Karkry was also all praise for Shankar’s direction style. “Director Shankar doesn’t like cliches. He wants something new and that is why he is successful. A R Rahman also sang my first song. I am very honoured,” he said. The film features Rajinikanth and Amy Jackson playing the lead roles and Akshay Kumar playing the villain as a crazy doctor. The film also has Oscar-winning music director A R Rahman scoring tracks and BGM. The makers of 2.0 had roped in Hollywood stunt choreographer Kenny Bates. He is famous for his work in action-heavy flicks including Pearl Harbour, Transformers and Die Hard. At least 120 people were killed in their sleep and nearly 200 injured after the Indore-Patna Express train jumped the tracks near Kanpur in Uttar Pradesh on Sunday morning, wrecking most of the coaches.